I had to make several visits to a rehabilitation center last year. I noticed a few patients getting around in wheelchairs with a tablet in their lap. It didn’t look easy. There appeared to be a fine balance between moving the wheelchair forward and not dropping the tablet. These weren’t powered wheelchairs. Today we’re talking about tablet mounts for wheelchairs. A good wheelchair mount needs to be able to do a few things right. 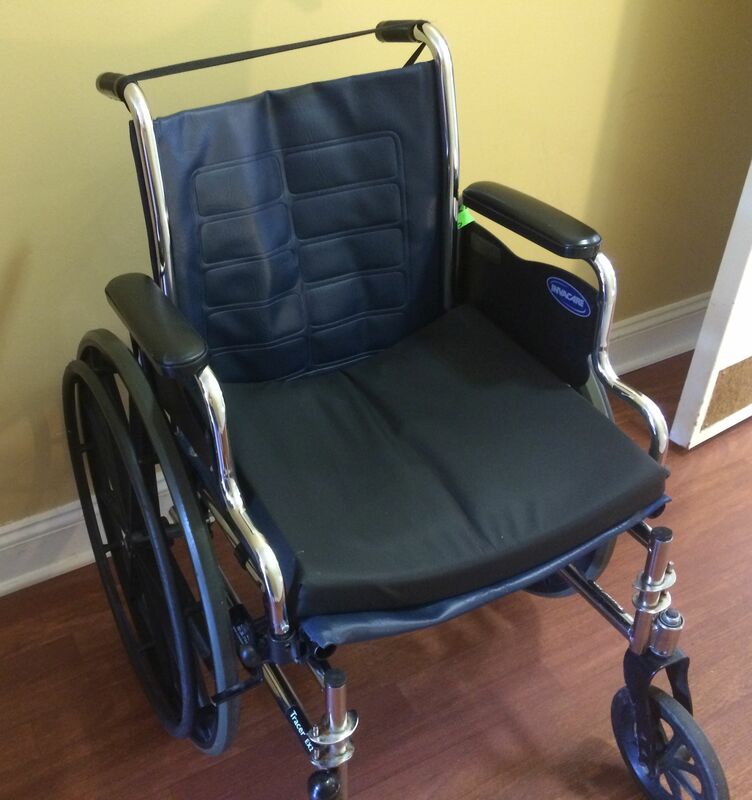 First, it needs to be easily installed somewhere on the wheelchair without drilling holes. I like to use clamp and vice bases for this application. The wheelchair that accompanies this photo is what’s typically found in a hospital or rehabilitation center. I suppose it’s typical of what one would find outside those facilities as well. There are exposed metal bars on each side and that’s a good place to attach tablet mounts for wheelchairs. Those metal bars typically have a diameter on 1.0 – 1.25 inches but measure it to make sure. Good tablet mounts for wheelchairs will also have the ability to be moved aside when not in use. A flexible gooseneck or one that has a few ball and socket connections will work well. Avoid anything rigid that could impede someone getting in and out of the chair. The last important things about tablet mounts for wheelchairs is the size of the holder. That’s the part that will grip the tablet. Measure the tablet to be sure the expandable cradle will open wide enough to accommodate the device. Also take any case or skin into account. Speaking of which I strongly suggest a good protective case to protect against accidental drops. Let’s look at a few good tablet mounts for wheelchairs. The Arkon Table Desk or Wheelchair Tablet Clamp Mount has been available for several years and is a very sturdy mount. The mount features a cradle with 8 included support legs. You will use four of the legs to hold a tablet. The legs that are used are dependent upon the size of the tablet mounted. The cradle is spring-loaded so it opens to ten inches when using the largest support legs. The cradle accommodates a wide array of tablets. Devices as small as an Apple iPad Mini to as large as an Apple iPad Pro will fit just fine. This also supports most of the Samsung Galaxy Tab tablets. The base of this mount has a clamp type of grip. The clamp opens to 2.25 inches so it’s going to fit practically any exposed wheelchair rail. The mount features an 18 inch flexible stem that can be bent out of the way to allow mobility. When is comes to finding good tablet mounts for wheelchairs, this one fits all of our criteria. A two-year warranty comes with this mount. We wrote an extensive review on the Arkon Gooseneck Tablet Mount which can be referenced for more information. The Arkon Heavy Duty Tablet Clamp Mount is also available to fit a wheelchair. It shares the same cradle as the previous mount which opens wide enough to fit most tablets. The clamp opens to 1.5 inches. It’s shorter than the previous and might even prove to be easier to use. When getting in and our of the wheelchair, it might be easiest to simply remove the cradle portion of the mount which simply slides upwards. The cradle is on a ball and socket so it can pivot and turn. The The Joy Factory Unite Universal Wheelchair Mount for Tablets is a mount that’s marketed specifically for wheelchair use. The included clamp opens to 1.625 inches. The cradle will accommodate 7 – 12 inch tablets so it covers most tablets except for the largest 12″+ sizes. The cradle opens and closes using a set of thumbscrews. There are three adjustment points for getting the best position. This mount includes a three-year warranty. So there we have three good tablet mounts for wheelchairs. All of these will attach to the exposed metal bars on a wheelchair. They feature expandable cradles and are relatively simple to install and remove.